Compact and handy: the K7 Compact pressure washer with water-cooled motor. 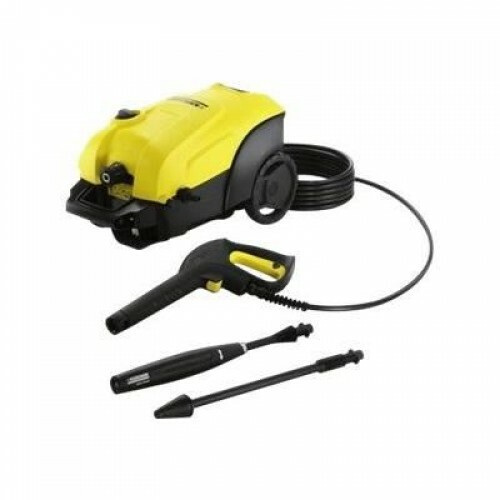 For frequent use and removing stubborn dirt, such as on paths, swimming pools, bicycles or large vehicles.The K7 Compact pressure washer is compact, handy and powerful. The device has a water-cooled motor and is just made for frequent cleaning jobs and stubborn dirt around the house. Equipped with two carrying handles and a telescopic handle, the pressure washer is easy to transport and packs neatly into a small space for storage. Furthermore, the device includes a Quick Connect gun, a 10 m rubber high-pressure hose and a water filter. And in addition, a Vario Power spray lance (VPS) which is simply twisted to adjust the pressure, and a dirt grinder with rotating point jet which removes even the most stubborn dirt without leaving a residue.